Purchase digital copy at iTunes. 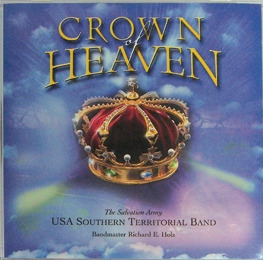 Hard copy and digital copy available at cdbaby.com. Bandmaster Nicholas Simmons-Smith's first CD with the Southern Territorial Band is a wonderful blending of psalms, hymns, and spiritual songs in band arrangements that represent three generations of Salvationist composers. The repertoire ranges from band classics such as the late Commissioner Dean Goffin's setting of the hymn tune "Aurelia," "The Light of the World," through James Curnow's psalm-like "Hallelujah," and moving through Eric Alexander's "New Orleans Street Beat" "Lord, Lord, You Sure Been Good to Me." Click cover to purchase CD.